24 Holy Child Mary of the royal house of David, Queen of the Angels, Mother of Grace and Love, I greet thee with all my heart. Obtain for me the grace to love the Lord faithfully during all the days of my life. Obtain for me, too, a great devotion to thee, who art the first creature of God’s Love. Hail Mary, full of grace… O heavenly Child Mary, who like a pure dove, was born immaculate and beautiful, true prodigy of the Wisdom of God, my soul rejoices in thee. Oh! Do help me to preserve the angelic virtue of purity at the cost of any sacrifice. Hail Mary, full of grace… Hail, lovely and holy Child, spiritual garden of delight, where, on the day of the Incarnation, the tree of life was planted, assist me to avoid the poisonous fruit of vanity and pleasures of the world. Help me to engraft into my soul the thoughts, feelings and virtues of thy divine Son. Hail Mary, full of grace… Hail, admirable Child Mary, Mystical Rose, closed garden, open only to the heavenly Spouse. O Lily of paradise, make me love the humble and hidden life; let thy heavenly Spouse find the gate of my heart always open to the loving calls of His graces and inspirations. Hail Mary, full of grace… Holy Child Mary, mystical dawn, gate of Heaven, thou art my trust and hope. O powerful advocate, from thy cradle stretch out thy hand, support me on the path of life. Make me serve God with ardor and constancy until death and so reach an eternal crown. 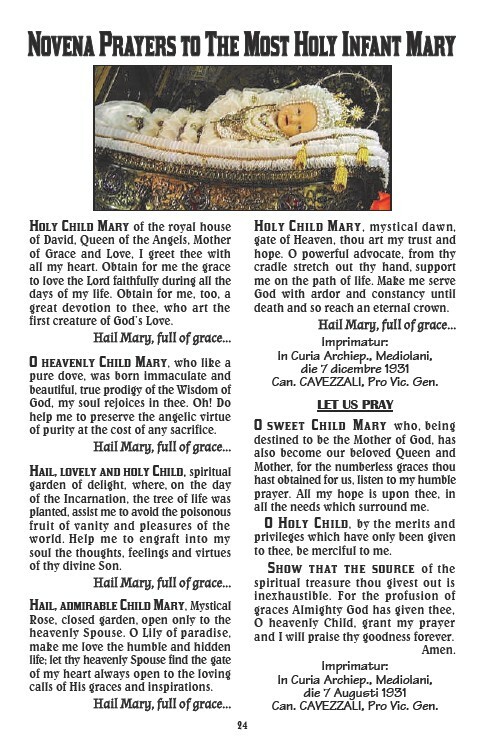 Hail Mary, full of grace… Imprimatur: In Curia Archiep., Mediolani, die 7 dicembre 1931 Can. CAVEZZALI, Pro Vic. Gen. LET US PRAY O sweet Child Mary who, being destined to be the Mother of God, has also become our beloved Queen and Mother, for the numberless graces thou hast obtained for us, listen to my humble prayer. All my hope is upon thee, in all the needs which surround me. O Holy Child, by the merits and privileges which have only been given to thee, be merciful to me. Show that the source of the spiritual treasure thou givest out is inexhaustible. For the profusion of graces Almighty God has given thee, O heavenly Child, grant my prayer and I will praise thy goodness forever. Amen. Imprimatur: In Curia Archiep., Mediolani, die 7 Augusti 1931 Can. CAVEZZALI, Pro Vic. Gen.